Alabama: An Alabama man lost his temper when he returned home to find his wife in bed with another man. The entire incident was captured on camera and circulated on social media. In the video, the wife’s lover, who can be seen wearing a T-Shirt and an underwear, tries to defend himself from the furious attacker. The video clip shows the aggravated husband climbing on top of his wife’s lover and punching him, before dragging him on to the floor. The helpless victim, however, tries to defend himself. 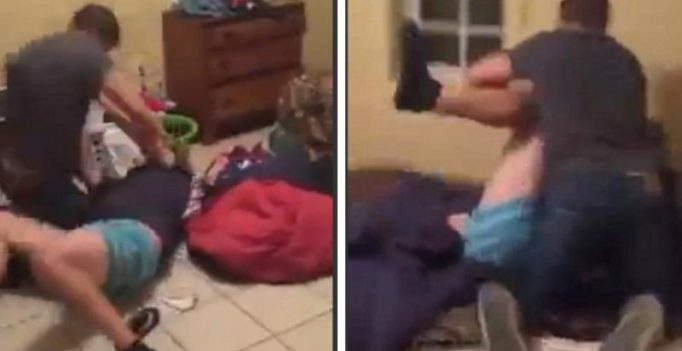 In the video, the husband grabs the man by his back and pushes him down on the floor. He then continues to assault the victim by punching and kicking him. At one point, the attacker can be seen stomping on the victim’s face.